We all love chalky paint, and of course, I still highly recommend buying Annie Sloan’s Chalk paint, unless you are on a tight budget or just want to save some money. Then you can make it yourself. But if you use the wrong recipe you will end up with a ball of goo that nothing can remedy, wasting both your time and money. My first attempt at homemade chalky paint was just such a disaster. The resulting paint was completely unusable. I had used plaster of Paris, since it was easy to find and inexpensive. But I simply cannot recommend using the plaster of Paris, since it does not incorporate well into the paint. My second attempt was again with Plaster of Paris, but I used a much smaller amount of POP this time. It worked but still had some small lumps. You can check out my table I nicknamed Lumpy here. Since Lumpy, I did some more research and found that most bloggers recommended using Calcium Carbonate instead. So I found the cheapest source of Calcium Carbonate (CaCO3) I could find, which in my case was Amazon, and ordered it. I actually got the CaCO3 several months ago, but just had time to try it this last week. Here is a BEFORE pictures of my mirror. 3 TABLESPOONS OF CALCIUM CARBONATE. I stirred it up and it worked perfectly. I did not have to constantly stir it and it incorporated very well into a smooth consistency with only a few small lumps. I think from what I have read that you can add as much or little as you want, depending on how chalky you want the paint to be. I painted several things and the consistency was good even to the bottom of the can. One reader said she found the CaCO3 at Home Depot. So that’s my story. And several other bloggers have confirmed that CaCO3 is what they recommend as well. Some have had success with other additives, but this is the one I can recommend. I used Fiddes Antique Brown wax after the paint dried. I purchased my wax here at John Millen Hardware. I do not make any money if you buy from them; I am only passing along the resource in case you want to know. I like using the Antique Brown when I am waxing something painted white. The clear doesn’t add any color and the other antiquing waxes are too dark for white paint. I like the mirror on my brick wall, so much better than this small clock that was there previously. BTW, I painted the clock too; I couldn’t help myself. I’ll show you that later. Have you made homemade chalky paint? What worked for you? I love this, Anita! I use Calcium Carbonate too; it’s amazing! Your mirror looks gorgeous! I still love Lumpy too! Thanks much for the chalk paint recipe. Can hardly wait to try it. Your mirror looks wonderful. I am glad to know the calcium is the way to go. I found the “recipe” for chalk paint this summer. HAD to run out all over to find the calcium, which I did. The stuff is still sitting here. I have yet to try it, but the way I was going about it you would of thought I was running home to do it! Glad that I waited though. Great job on the mirror! I haven’t tried ANY kind of chalk paint, but your mirror has turned out wonderfully! Now just to find some of the miracle additive!! I’ve never made my own Anita but it looks like it worked for you because that mirror looks FABULOUS!! WOW everything looks fabulous, you have me very intrugued!!! You are too funny, Anita! I wish I had this recipe before I paid $$$ for ASCP! I’ll be trying it. Anita, you are very clever. The mirror looks terrific. Great “look” for your mirror! I’m curious to know about the reasons chalk paint is preferred over plain old “flat” paint. Guess I’ll have to research a bit further (or if you’d like to email me, that’d be great! acceber48@juno.com) I KNOW it’s really taking the country by storm! Thanks for this great tip. I plan on making some for myself and wondered the best way to do it. Now I know! I’m so glad I read your preference in making your own chalk paint…I had actually written down a recipe using the POP and was going to try it on a dresser in the den when I start my re-do but won’t be buying the POP now that I’ve read this review. My original plan was to use flat paint and distress and glaze like I’ve done other pieces of furniture that turned out looking good…still might stick with that tried and true method that works for me! Rebecca, chalk paint can be applied to most any surface without priming or sanding, even over wax. And latex paint usually needs to cure for a while before you can distress it, but you can sand off chalk paint pretty much as soon as it dries. Thanks for sharing this! I’ve been wanting to make my own chalk paint because I can’t afford to keep buying quarts of it. Now I’m off to find some calcium carbonate! The mirror turned out simply gorgeous…I love it! I use unsanded grout (I think its two tablespoons per cup of paint) and I thought it worked great. I would rather buy ASCP and its not so much that is expensive, I just cant find it in the states and I would end spending double the cost of the paint on shipping. Your mirror turned out to be a beauty though!!! Great job! Rasonda, I used unsanded grout as well to make a chalkboard, it worked out great! No I have never made chalk paint or used it yet….Looking forward to using it on a bed though. Love the mirror and the brick wall. Your mirror looks absolutely beautiful especially against the brick wall…much better than the clock 😉 And the chairs, too! I have been debating which direction to go with the homemade chalk paint. I don’t want to spend that much money on the real stuff so you’ve convinced me. Now, where to find the calcium carbo…. Nah, I think I’ll buy some via Amazon; my favorite shopping store! Thank you so much. Thanks for the great info on making your own chalk paint. The only recipe I had seen was to use unsanded grout with flat paint. I had not tried this yet so I don’t know, but I like your solution…and your mirror. I have not made chalk paint but am going to Amazon right now to get the calcium carbonate. Thanks for the tip about the wax too. If I don’t buy the expensive chalk paint I can afford the good wax! This was a great post…thanks! This is so pretty! Great info, too. Wow! It looks awesome! Can’t wait to try this! Sharing it to my FB!! Lovely results on your mirror! I haven’t painted any furniture or anything else in quite a while. Perhaps its time I look into what’s out there on the market. Thanks for sharing your fabulous results! Your mirror looks great, and Lumpy isn’t bad either. I’ve never used chalk paint. How is it different from just using, say, a flat latex? Marti, see my comment above, and I’ll try to email you. I have not made any homemade chalk paint, and in fact am anxiously awaiting my order of ASCP to give it a try. I made note of your dark wax tip too. I’ve used POP to make my chalk paint– as per Sherry’s instructions and it worked for me. I wasn’t going for pristine as I was refurbishing/repainting a curbshopped demilune table. But I plan to make more for some up coming projects …I’m not buying the calcium carbonate…because well, I have the HUGE economy version of POP…and there is no need really. love your mirror on the brick wall. 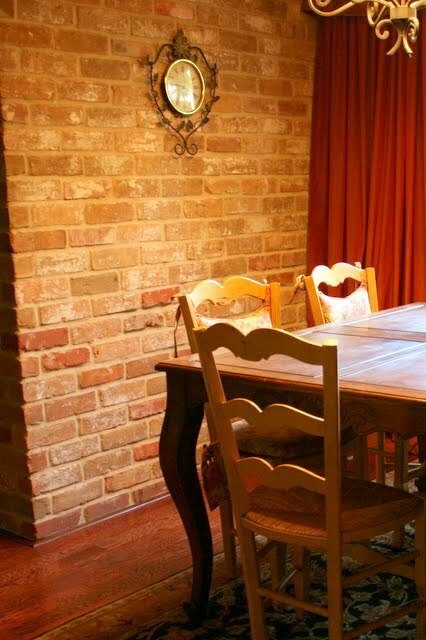 I’d love me some brick wall inside my home. Thank you so much for this recipe. I have wanted to use chalk paint but felto AS was too expesive for my budget. I am going to HD tomorrow. I have several items that need to be painted. I will let you know how it works out. I am a new follower. Please come by to visit me. Thanks! I’m definitely going to try that! Your mirror is FAB. You did such a beautiful job of giving it just the right amount of distressing, and I love the brown wax, too. No one near me sells any brown wax – I’ve only been able to find clear wax. Thanks so much for the info about C C, I think I’ll see if they have some at my Home Depot. I have yet to try it but do plan to make some soon. If I keep buying A. Sloan products, I may go broke!! Beautiful job Anita and I love the mirror against the brick! Thanks for sharing this and the chalk paint tips with us at Inspiration Friday! Your mirror and Lumpy are both gorgeous! I tried homemade chalk paint for the first time on a dresser that I just refurbished. Because it was easy to find, I used Plaster of Paris. It was great when I first mixed it, but if it sat for more than half an hour (say between coats) it got clumpy and stiring just made matters worse. I ended up making tiny batches for each coat of paint. I will try the calcium carbonate next time. Thanks for the advice! Hey Anita…I’m ready to order some calcium carbonate but wonder what exactly you ordered? There are several different brands on amazon. No hurry. Thanks for the help! Well first I tried it with grout . . . the wrong kind! I got the ‘sanded’ which duh, means it has grains of SAND in it — let’s just say that didn’t work. Now I have the ‘un-sanded’ — I’ve yet to try it but it was cheap and accessible so I’m hoping it works. I have seen lots of bloggers recommend the Fiddes wax, so I am going to have to order some. I am not all that thrilled with the AS dark wax. I find it hard to work with. Is there not anywhere else to purchase the wax!!?? I have looked and looked! I’m wanting to find it here in the DFW area. SURELY it’s here somewhere!?? 🙁 I want to try it out so badly! Bliss- are using the light wax with it? I hear you have to use a coat of clear, then dark. And then if you want to lighten it up some, you have to use more of the clear to “pull it off.” This is why I am also wanting to order the Fiddes though. That’s too many coats…too much money spent. Especially to just get the effects of the dark wax. Just wishing I knew of a local place to get Fiddes. I don’t like ordering online and paying shipping and such! I’m so glad I read your post today. I have a couple of pieces I plan on painting this weekend. I’ll try your recipe and let you know. I feel so inspired to give this recipe a try. thanks for sharing the recipe and how it is done. I have beenusing this cac.carb.too,works w/any color,very cheap to make & works great,way better than pl.of paris. Hi, I love your post. I painted a few small things with my home made chalk paint from pop, it was a little sandy but as I brushed it, it smoothed out. I haven’t waxed it yet. I want to paint something large but for some reason I’m a little afraid of the waxing. Is it as hard as antiquing something with a stain?? I know using chalk paint is easier than latex because you don’t have to sand and prime but if you have to wax it after, doesn’t that make it just as much work ? I also liked your post about blogging! Great job Anita! I use calcium carbonate too, ıt works well. Hi Anita! I’ve heard baking soda will work as well, I just haven’t needed to try it yet. Worth a try since we all have baking soda on hand. PS. Thank you helping me last week…Hometalk is great! I have a question about the home made chalk paint. When you mix the Calcium Carbonate with the paint. do you first mix it with water to make a paste or just mix it right into the paint? With the PP you have to make a paste first and I was wondering if you have to do the same with the CC. Thank you for your help, I want to try this recipe. Keep up your beautiful work and thank you for sharing with us. Have you ever used the paint samples you can get from BM or SW? I have more than a few I love, but am concerned about longevity. I know I’d have to seal them, but I’d be doing that, anyway. Thanks for all your efforts and sharing! Calcium carbonate (also called whiting) can be found at ceramic supply stores. I picked up a pound for $1.83, 5 lb. is $7.50. It can be used in air dry clay recipes too. Whiting!! that used to be for cleaning Lawn Bowlers Hats! Tks, who Knew!! Hey, just FYI on the chalk paint. I’ve used Plaster of Paris and it works beautifully. You just have to dissolve the POP in water first then stir in your paint. The recipe I use is 1/2 C POP, !/2 C water, and 1 cup of latex paint. Thought I’d share since CaCO3 is harder to come by. I used POP paint on an old mirror with plaster ornamentation and a sirocco shelf. It worked beautifully. Although it won’t save for later use, so don’t mix up too much and plan to save it for another project. It turns hard as a rock in the container. Also, it cures fast, so don’t delay with the distressing after it dries. I had to use sandpaper on what i didn’t finish distressing the next day. I love the looks and wish i had a blog on which to post the family treasure mirror and the shelf. A little gold rubbed on made it tres fabulous. The ASCP colors are nice, but it’s also nice to make one’s own chalk paint in the wide variety of colors available. Saving 50% never hurt me. Can you use this on walls in your kitchen without using wax over it? What kind of outcome would there be? Ann, it would be very flat and rough to the touch. If that is what you are wanting, then it will be great. If you want a smooth finish wax would be great. May I ask why you want to use the chalk(y) paint on the walls? There may be no value in using it on your walls. ASCP is very $$ here $59.95!..So I’ve tried Plaster of Paris, the trick is to mix it in hot water to dissolve all the particles and only mix a small bit at a time (wait till it cools before adding it to your paint)- I’d love to try CaCO3 and the grout idea, saw white fine grout at the local hardware shop. Thanks Di!! Not sure what is in ASCP. I love the way your chalk paint looks. I have made some myself with plaster of paris and paint . Mine turned out very well. Maybe it was because I really stirred out the lumps with water before adding paint? I used an old wisk to do so. I also used 1 part mixture to 3 parts paint and kept the leftovers in a jar which I shook up before using each time. So far it has lasted over 2 months. I can’t wait to try the colors you have shown us! I hope my tips help. Love the mirror….just perfect. Ques…I was about to begin painting a mirror today with ASCP…but had a battle with the piece just trying to tape off the mirror from the frame. Do you tape before painting these type of items or just razor off excess after? Thanks so much! I scrape it off later. It’s probably neater using tape though. I’m a little late, since your replies are from 2012, but I use POP mixed with calcium carbonate and water. If you mix equal parts of these together before adding the paint, it will be smooth. After I looked all over for the CC powder, I was told that bone meal is the same thing. Good luck! Ps love the mirror. I use NOW brand Calcium Carbonate and I buy at heath food store. You may have to ask them to order. I mix in two Tbs water with the 1/2 cup of CC and mix that into one cup of paint. After reading the above comments regarding POP chalk paint, I’m really feeling like a failure! I tried to make chalk paint with POP and it was a disaster. Complete. Disaster. I have been scared to try again. I am excited now about using your recipe. It just sounds like it would work better. Maybe it’s just my fear of another failure. I called Home Depot and talked to a very patient, nice guy. I told him my intended use and he informed me that lately a lot of females have been asking for the calcium carbonate and buying the paint samplers. So, he and I assume more people are trying this combination. Thanks so much for giving me my confidence back! I also use Calcium Carbonate when making chalk paint. I have used 2 parts latex to 1 part CaCO3 and a few drops of water, if needed. I like your proportions better because the CaCO3 will last longer. Thanks for the recommendation of the Fiddes Antique Brown wax. I have used either clear or dark wax. The antique brown gives it a nice warm look judging from your beautiful mirror transformation. I also use ASCP (I am also in Australia) which is lovely but expensive here. Have u ever ventured into painting fabric with chalk paint ? I’ve read u can then waxing it. What are ur thoughts on this? I also use calcium carbonate. The cheapest source I’ve found online is Duda Diesel. Great service & free shipping. I’ve also used Webster’s Chalk Paint base mixed with latex paint, but I think that it’s just calcium carbonate, too, and more expensive. Hi I used power grout mix with paint ,came out great! Came across your blog/website by accident recently…….loving it. And your mirror turned out darling. I have been rehabbing furniture for years. Calcium Carbonate is totally the way to go. I usually mix 3 tbls of it into a small container and add a drizzle of warm water. When dissolved, I add it to a cup or so of paint. If you live near a Natural Grocer of Vitamin Cottage, they always have it on hand. PS…..love your slip covering tips…..awesome. Thank you for the recipe. I want to do an “painting after noon” with some friends this summer. If I wanted to paint colored, do I had pure pigment? I am not sure I understand the question Sylvie. You add the calcium carbonate to the paint. Get the paint in whatever color you want. Athletic line marking powder is calcium carbonate, maybe that would be easier search since it’s ready to be available at hardware stores, but not named calcium carbonate, but rather line marking powder.